Online Poker machines are a diverse bunch with just about every combination of themes, symbols and payouts that you can imagine (within reason of course! 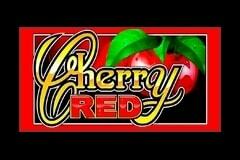 ), but Cherry Red, from Microgaming, takes it all right back to basics with an age-old design and straightforward rewards. All that players need to do is decide how much to bet and click to spin the reels, with no side games or other features to distract them from that basic task. Pokies like this have been popular since the very first games were introduced over 100 years ago, and now that most players are online, they are still attracting an audience. One look at Cherry Red should be enough to make up the minds of potential players who will either appreciate the classic nature or be completely put off by it. If you are one of the latter types, read on however, and you may decide it’s worth a quick spin just to see what the enduring appeal of these games is. Anyone who has played a traditional pokie will be instantly familiar with the design of Cherry Red as it’s been designed to emulate the classic machines and to attract those who like to reminisce about these games from the old days. 3-reels and a single winline are all you’re getting here, with a paytable off to one side that lists how many coins will be winging their way to your bankroll once identical symbols line up. It’s actually rendered quite well, with a 3D effect to the reels making them look more realistic, while the symbols themselves are bright and crisply drawn. Even the bet range is old-school, although that’s not really a compliment as it limits both low and high-stakes gamblers. The minimum wager required to get the reels spinning is 0.25, while coin values can be adjusted using the + and – buttons to 0.50, 1.00, 2.00 or 5.00, and players can activate 1 or 2 coins for a maximum bet of just 10.00. Once a stake is decided on, all that’s left is to click and spin the reels, waiting for identical symbols to land across the single line. By checking the paytable, it’s easy to determine what prizes are associated with which combinations, although it’s worth noting that wagering 1 coin will pay out half the amount that wagering 2 coins will. The ratio stays the same however, so we will assume a 1-coin bet here. Looking at the symbols won’t reveal any surprises, so starting at the bottom, the Bell is worth 2 coins for just a single example on the payline, while getting any Bar will be worth 3. If 2 Bells appear on the line, it’s a 5-coin payout, and a full line of the single Bar pays you 10 coins. Moving up, it starts to get interesting, with a nice 20 coins for a line of 3 Bells, and the double Bar will result in a 25-coin prize. Triple Bars are worth 50 coins when 3 land on the line and regular symbols are topped off by the red 7 icon that will see 100 coins added to the bankrolls of anyone who lines them up right across the 3 reels. The red Cherries that give their name to this pokie are the one special feature, awarding the maximum prize of 800 coins when they run right across the line, but also acting as a wild symbol, meaning that they substitute for any other to help complete a winning combination. So for example, 2 Bars wouldn’t win anything, but 2 Bars and the Cherry not only equals a winning line, but the payout will be doubled in value to 20 coins. If it was a single Bar and 2 Cherries on the line, the resulting win would be multiplied by 4x to 40 coins, so the Cherry is by far the most rewarding icon to get, whether on its own or in combination with any others. This is a pleasingly designed pokie that’s one of the better attempts at recreating the classic machines of old. No, it doesn’t break new ground, and no, you won’t be enjoying free spins or bonus rounds, but this isn’t the aim here and those of us looking for some nostalgic pastime could do a lot worse than give the reels of Cherry Red a spin. If there’s any criticism to the game, it’s more to do with a limited bet range, and while the minimum of 0.25 per spin isn’t going to break anyone’s bank, it will still rule out a portion of players who like to make micro-bets, just to see how a game plays.